Surge Radio recently descended on the Bridge for the Surge Awards, a new event aimed at recognising the hours put in by dedicated DJs, producers and content creators within the media department. 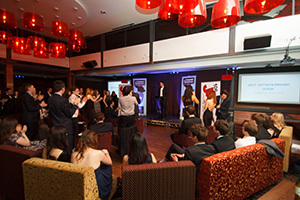 Nominations were put forward in the form of four minute demos, to be judged by radio professionals from BBC Radio 1, BBC Radio 2, Capital FM, and Jack FM, and awards were distributed by Hayley and Welshy from Jack FM’s ‘Bam Bam at Breakfast’. 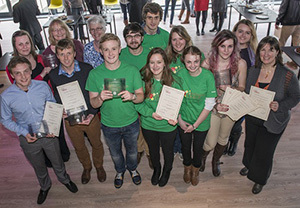 University of Southampton held the first Sustainability Action Awards last week, with staff and students being praised for their commitment to sustainable practices both within and outside of the institution. More than 50 people attended the ceremony which took place on Wednesday 26 March to celebrate the initiatives being undertaken by both individuals and groups. Students’ Union President David Gilani and Chief Operating Officer Malcolm Ace were on hand to present the awards, with the event being led by the University’s Sustainability Champion, Pro Vice-Chancellor (Research) Professor Judith Petts CBE. 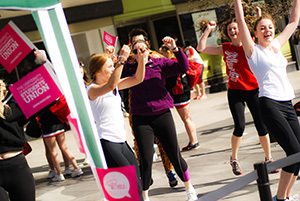 Hundreds of eager fundraisers crossed the finish line for the Sainsbury’s Sport Relief Mile in Southampton’s Guildhall Square on Sunday 23 March 2014. Families, schoolchildren, army troops and participants in fancy dress turned out to support the nationwide Sport Relief campaign which generates valuable funds to transform the lives of people living in Southampton and around the world. As part of Southampton’s 50th anniversary city celebrations, the Cultural Quarter welcomed crowds to complete the 1, 3 or 6 mile course around the central parks and committed participants were rewarded with a special medal at the finish line. The Easter holidays are coming! 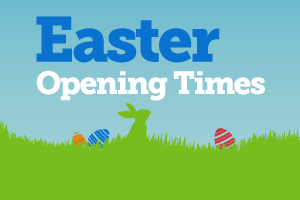 SUSU will remain open during the break – other than Easter closure days- although some facilities will be running reduced hours. A full list of opening times is below. Happy Easter! SUSU, and the rest of the University, will be closed 16 – 21 April for Easter itself. 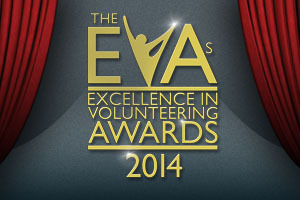 Final countdown and another top act announcement! With less than a week to go until tickets officially close for Grad Ball 2014 that over 50% of the tickets have officially sold. 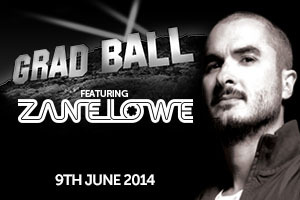 What’s more we’ve just confirmed Radio 1 DJ Zane Lowe as another act for the night. Known as ‘the voice of the alternative’ Zane is one of the most enthusiastic, well-versed, inclusive and entertaining DJs in music broadcasting today. Opening gigs for the likes of The Prodigy, Deadmaus, Skrillex and Pendulum, Zane’s increasing popularity has seen him sell-out his own DJ tour and gain a range of positive reviews. 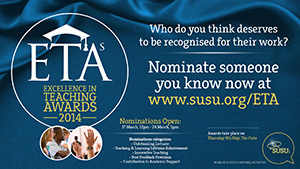 Nominations will soon be closing for the Excellence in Teaching Awards 2014. This is your chance to say thanks to a member of academic staff who has gone out of their way to help you do brilliantly in your module. Perhaps your tutor gives amazing, fully-packed lectures. Or perhaps they always give you a chance to talk about your feedback. Maybe they always find new ways to help you develop your skills. Maybe they’re outstanding in how they support your learning. Or it might just be that they’ve had inspired you through their teaching. On Thursday 21 March it is Sexual Health Day and to celebrate we will be holding a special event on the Concourse 12-4pm. Come along and pick up some free condoms, learn more about STIs and try out condom demonstrations with the volunteers ‘Sexpression’. 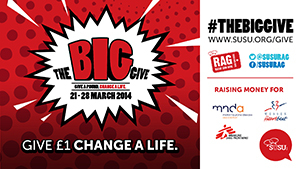 Last May saw SUSU (University of Southampton Student Union) host their annual Big Give – A week long charity campaign looking at the impact donating £1 can have on local causes. This year the event is back with a bang with a week of exciting fundraising activities taking place from the 22 – 28 March. The Big Give motivates both students and staff to ask “what else would I spend £1 on” and is based on students not having to do anything out of the ordinary to make big change happen.